Lock in a great price for Far Out Inn – rated 8.9 by recent guests! It was very cozy and comfortable. The views from our room were breathtaking. Kati and Pati were amazing hosts. They made us feel welcome and comfortable, both very knowledgeable about local restaurants and culture. Each room has its own personality: the Garden room is a cozy retreat and the Countess is big and bright with a perfect view of La Concha. It's about a 20 minute walk to old town for pintxos and shopping. The house is above the city noise on a quiet hill but you can see the entire bay and hear the waves from your open window. Mattress and bedding is the most comfortable I've ever slept on, great coffee for breakfast, yoga in the living room, etc. I truly felt at home here. Our hostess Kati was extremely friendly and attentive. The B&B not only accepts pets (our dog) but genuinely loves them. The B&B was situated in the most beautiful of locations, with sweeping views of the city, beaches, and bay. Wonderful location with amazing view!!! Loved breakfast especially the fresh squeezed orange juice. Lovely and friendly house manager. It was a great experience. The staff was great and the place was amazing and convenient. Bohemian destination for the artist at heart....great hideaway to enjoy a spectacular fantastic incredible view......thank you! Spectacular location on the hillside overlooking La Concha Bay. A generous and delicious breakfast and helpful staff were greatly appreciated. Terrific location. Helpful and engaging staff. Super cute. The staff was fantastic. Jaime was very helpful and prepared a fabulous breakfast. Loved the fresh squeezed orange juice, tea assortment and fresh warm bread. The view was spectacular from my room. The bed was extremely comfortable and I slept like a baby. It was very close to the beach although you did have to walk down 200 steps. Keeps you in shape. Could walk on the promenade to visit all beaches, old town and surrounding area. The location was great! The caretaker was very nice and helpful. The view from the common areas is very nice. Featuring free WiFi throughout the property, Far Out Inn B&B offers pet-friendly accommodations in San Sebastián, 0.7 mi from Victoria Eugenia Theater. Guests can enjoy the on-site bar open between 18:00 - 20:00. Free private parking is available on site. Some rooms have a seating area to relax in after a busy day. Views of the sea, mountain or garden are featured in certain rooms. Extras include bathrobes and a hairdryer. Kursaal is 0.9 mi from Far Out Inn B&B, while Anoeta Stadium is 1.2 mi away. The nearest airport is San Sebastián Airport, 11 mi from Far Out Inn. 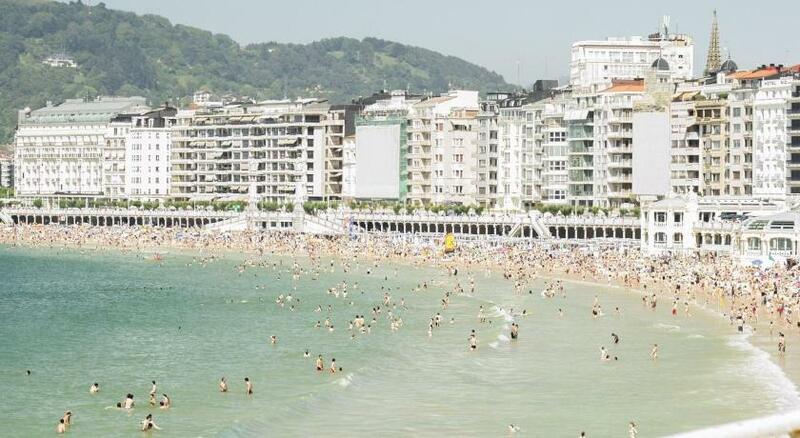 뀐 Located in the top-rated area in San Sebastián, this property has an excellent location score of 9.2! When would you like to stay at Far Out Inn? House Rules Far Out Inn takes special requests – add in the next step! Far Out Inn accepts these cards and reserves the right to temporarily hold an amount prior to arrival. Please note that dogs and cats might be found sometimes at the property. Please note that late check-in after 21:00 carries a surcharge of EUR 20. Staff and host were delightful. 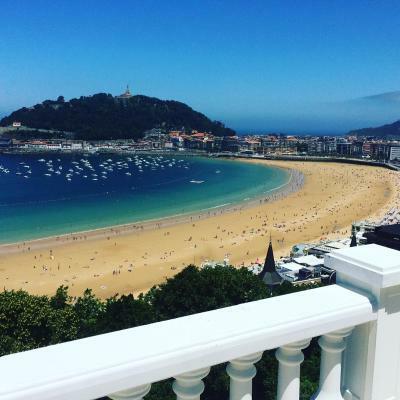 We couldn't fault the cocktails and the view was to die for.Also an excellent position to explore San Sebastian. Very friendly and helpful staff. Fabulous views from most rooms, as well as breakfast area, free parking, free wifi, extremely comfortable beds, rooms beautifully decorated. In a fantastic location overlooking the main beach. It took us approximately 20 minutes to walk to the Old Town and we are over 70 years old. We think the Far Out Inn B & B is a warm and wonderful place to spend time whilst on vacation. It’s was perfect for us and we highly recommended it. The view was stunning! The rooms were lush! Onsite parking. Elevator to our room balcony. Breakfast was European and good. The staff were very friendly and helpful. Great location! We loved it and highly recommend. A little disappointed on arrival as I believed we had booked the ensuite ocean view room but put into the Garden Room. Whilst this was comfortable the bathroom was next door. Also next door was a kitchen and although the staff were trying to keep quiet you could hear the taps being turned on and off and plates, pots and pans being moved. The room is also to the front of the house which meant you heard the traffic from the main road. Fantastic location with great views across the bay. Very dog friendly accommodation. Access and parking a little tricky as we are in our 70s and the Far Our Inn is situated on a fairly steep road . extremely helpful and pleasant staff who even looked after our dog whilst we went to see the town and again later whilst we went out for a meal. We were the only pet owners there though ! Lovely breakfast too. Amazing views of the bay. Getting through the front entrance gate was a problem, having someone there to open it when we arrived. And then making the bend to the lower level carpark was extremely tight and evidence of other cars not negotiating it properly, we had inches to spare ,once down to the lower level there was plenty of room .Couldn’t see why the larger cars couldn’t park on the middle level? The room was clean and tidy and the views from the balcony stunning. Also the view from the breakfast area again with stunning. Loved staying at Far Out Inn and enjoyed our time in San Sebastain! The garden room was so comfortable and we had the best night sleep, after a week traveling through France. The view from the conservatory / breakfast room is THE BEST in the city - looking out right across the bay... an incredible way to start the day! Great bnb and a lovely base, with delicious breakfast and all round experience. Kate, Kitti and team are so welcoming and nothing is too much trouble. Highly recommend and will be back for sure. Thank you! - Great location, on the hillside of the beach. We just need to go down the stairs about 5-10 min to reach the beachfront. - Very beautiful view of the beach from the breakfast area. - Kati was a very friendly n helpful host. - There's free parking on site, convenient for us who drive.